Illusionist Penn Jillette recently revealed to Tuscon Weekly that his estimation of magic was changed by James “The Amazing” Randi, who taught him that it is an honorable profession provided that audiences are fully aware they are being deceived. I suppose the vast majority of those who bothered to tune in to The Rock ‘n’ Fun Magic Show, a gaudy spectacle featuring Bill Cosby, Doug Henning and the Hudson Brothers that aired in the fall of 1975, were cognizant that they were being exposed to illusions rather than manifestations of the supernatural, Henning’s wide-eyed proclamations that “anything is possible” notwithstanding. I, however, was only seven years old, an age at which I accepted almost everything at face value. Even though I understood that all magic was some sort of a trick, I totally bought into the false drama that Henning employed to heighten the effect of his most dramatic stunt. As Henning was lowered into the tank, a digital timer was superimposed upon the proceedings. A pair of assistants secured the lid of the compartment and descended from the platform, allowing a curtain to rise and envelop the tank. This was when the host really earned his paycheck. Just after the two-minute mark, a robed attendant darted offstage and returned seconds later holding an axe. At two minutes and thirty-nine seconds, with the robed attendant having already taken his backswing, the curtain dropped to reveal an empty tank. Silence. Expressions of awe and laughter, then vociferous applause and a standing ovation when the axeman dropped his implement as well as his robe, revealing the mustache-framed, goofy smile of Doug Henning. I could almost hear my racing heart as I exhaled sharply and fell back into the couch cushions. I didn’t like being cruelly misled into thinking that someone I admired was on the verge of death due to an escape stunt gone awry. I also felt a little stupid for having believed it. On the other hand, I was impressed by the illusion and the degree to which I could be distracted by artful staging and patter. Obviously, Henning was free from the contraption long before I even suspected it might be possible. That element of magic, the misdirection and subsequent surprise, enchanted me. I thereafter embarked on every introverted young boy’s required rite of passage: a little dabbling in prestidigitation. I started slowly, consulting children’s library books that detailed basic tricks that required only household objects and a little practice. Soon I became proficient in the mystifying art of pushing thumbtacks into balloons without popping them, but I lacked the dexterity and patience to do the necessary preparation for peeling a pre-sliced banana. After trying out these tricks and whatever else I was able to accomplish with the likes of matchsticks and handkerchiefs, I was ready for stronger stuff. I found what I was looking for in an amusement park gag shop, nestled in a bin next to the rubber pencils. The finger guillotine was a sleek little prop that was cheap and easy to use, plus it allowed any kid to create a seemingly impossible illusion. Its instructions advised stoking an audience by using the unsharpened blade to thwack a carrot in half, which was easy enough to do if you took care to avoid the thicker carrots. Once you convinced folks that the device could render anyone a digital amputee, you stunned them by placing your index finger in the hole and passing the blade clean through it. At least that’s how it worked provided that you set the trick blade to “finger” instead of “carrot”. I forgot to do that once, and it’s a wonder I didn’t break my finger. I’m not surprised that you don’t see too many of these gizmos being peddled to kids these days. Observing my passion for sleight-of-hand, my parents indulged me with a generous order from the Marshall Brodien TV Magic Catalog. Though one of the gags proved to be a dud (Smoke From Your Fingertips was nothing more than a tube of clear goo that was supposed to effervesce from your artfully waved hands), I was thrilled with the rest. There was a hollow, metal cylinder that looked just like a stack of nickels when you put a real one on top of it, allowing me to thrill spectators by changing nickels into dimes. There was a pair of plastic bowls with a clear disk of the same diameter that enabled me to apparently change water into rice. A cleverly designed coin chamber gave me the ability to seemingly push nails through a half dollar. The inarguable highlight, however, was the magic box. 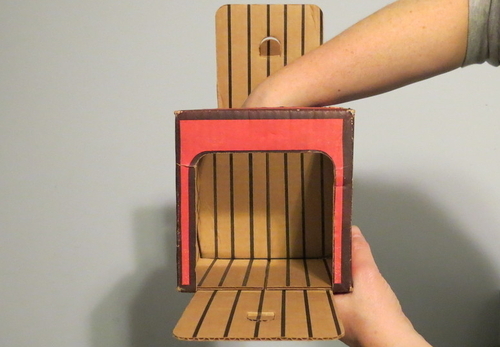 The magic box was a red and black, cardboard cube with doors that opened on the front and top. Thanks to a mirror that crossed the interior diagonal and concealed half of the cube’s volume, it was a snap to make any small object vanish or unexpectedly appear. It was an absolutely great illusion, one that looked so good it could stupefy the skeptical. It also required very little practice to employ effectively. Ultimately, it was my unwillingness to commit myself to more than a half-hour of practice that ended my brief experience as an illusionist. That and the fact that I began to perceive most magicians as more annoying than entertaining. My magic box went on the shelf. But it didn’t go away. I just moved it to a different shelf – one within a cabinet at my elementary school. In the world of education, I’ve found that the occasional illusion can keep kids thinking. It can also help smooth over awkward moments. Just this year, I had to confiscate a small item from a student who would not put it away during a lesson. The day ended with both of us forgetting to resolve the incident. When the next morning arrived and I remembered I had something that belonged to that student, I had a hunch he would mention it the moment he walked in the room, and so I concealed the contraband in the magic box. Sure enough, my unwitting student entered the classroom, approached my desk, and politely asked if I would return what belonged to him. I maintained the soberest demeanor, while inwardly I was as delighted as a little boy whose shipment of Marshall Brodien magic had just arrived. Without saying a word, I produced the magic box, opening its doors to reveal its apparently empty interior as my student looked on quizzically. Then I closed the front door, reached in the top, and withdrew the item he had requested. His expression was priceless. Word got around the class about the trick, and I’ve since pulled a few more things out of the box and made a few things disappear. Perhaps it would be most educational if I were to reveal the perceptual science behind the illusion, and maybe I eventually will. For now though, I’ll maintain that I’m still on honorable ground. The kids know they’re being deceived; they just aren’t sure how. And me? I get to amaze a captive audience with little to no practice required. 1 comment on "Every Boy Does Magic"
Omg-how I hated your magic obsession! Humoring you was at times excruciating (same with Alex years later :)) so glad you finally found a good use for it!